Four years ago, on June 22, 2008, Jeanie, Robin, Erin, Malinda and I completed Ironman Coeur d’Alene. It’s an anniversary I celebrate again and again. It’s a anniversary I love even more than my birthday, though I do at times celebrate my birthday with an Ironman theme. Yes, that was the best birthday cake ever. Thanks, Mom. Every year around this time, I think about how 2008 felt. It was the perfect year. I had a job I adored working with a man I respected for an incredibly appreciative group of clients. I was training with a triathlon club that challenged me and made me laugh. I hired an image consultant to help me revamp my wardrobe, much of which I’d had since high school. I rewarded my Ironman success with a new triathlon bike. (Actually, Mom ended up buying the bike for me, which was an extra sweet deal for me!) I was running with my sister, who had recently discovered her love for running. 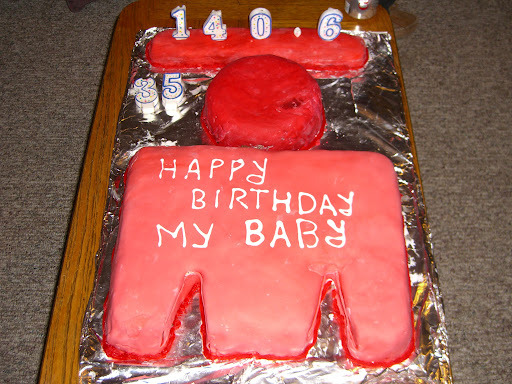 I also celebrated my birthday that year with the amazing Ironman cake and a few dozen good friends and my family out at my parents’ place in Henly. I don’t see how that year could have been more perfect. In 2009, so much changed. That year, I saw the vile reality of the character of someone I had once considered to be a friend. I left the job I loved because it became unbearable, almost overnight, for reasons I still don’t understand. After months of not feeling well, I had an unexpected surgery that helped me feel better but ended my goal of a 2009 Ironman. By the time my birthday came around, I didn’t feel I had much to celebrate, so I didn’t. That’s life, I guess. Things go up and down. I cling to the ups and try to navigate the best I can through the downs. The really great thing about 2008 was that I knew how high an up it was even when I was in the thick of it. Sometimes I don’t know. Sometimes it takes change for me to know if something was good or bad. But in 2008, I knew it was good. I felt it. I lived it appreciating each day of its charm. Ironman was an enormous part of that charm. That’s part of why I try to achieve it again and again. It’s an experience that changed me for the better. It lifts me up in a way that no one and nothing else can. I love that. I love it. And I love the girls who helped me achieve it the first time. Thank you, Jeanie, Robin, Erin, and Malinda. You guys are forever woven into my most favorite, most encouraging, and most inspiring memory of all time. I will never forget the first time – no matter how many years or races pass. I’m in the Army now. Not the United States Army, silly. I don’t have the stomach for that. 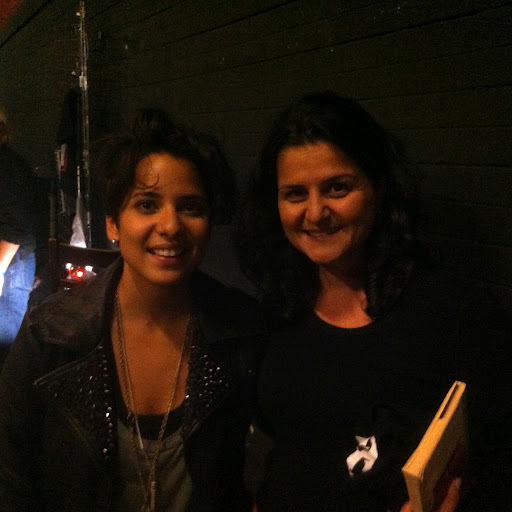 I’m talking about the Vicci Martinez Army! I sat down tonight with my copy of Harry Potter Book 6, fully expecting a quiet evening by myself. Before diving into my book, I picked up my iPhone and checked the Facebook app, as I often do. This time, I saw a message from the Vicci Martinez page. It said, “Oregon!! Come on out to he Hawthorne Theatre for the first show of our tour tonight!!! Can’t wait to play!! !” Hawthorne Theatre? That was just blocks away. I turned on my computer and looked up the time. Blocks away? Now? 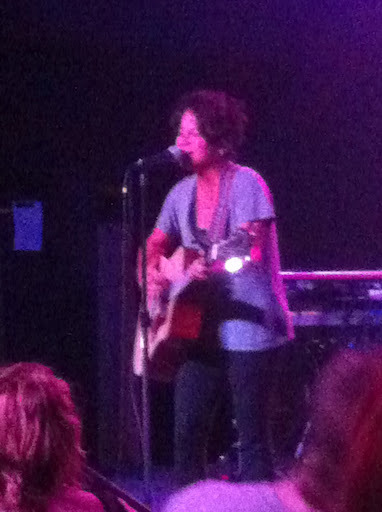 Vicci Martinez? I’m in! So I got dressed and set out to the show. It was out of character for me to set out for a show on a school night by myself. But I did it. I love Vicci Martinez from her days on The Voice. I still think the Vicci/Nikki battle was the best. Tonight, I loved what I heard of her new album. It’s different than her earlier stuff. Her words and music are stronger. She seems more committed to what she’s singing and how she’s singing it. It’s almost as if she’s matured musically somehow, which is weird for me to say since I know nothing about music except what I like and don’t like. Maybe she’s built up her confidence. I don’t know what exactly, but something is different about her. Now that I’ve seen her live, I’m convinced that anyone who isn’t moved by her energy doesn’t have a heartbeat or doesn’t have a soul. Thank you, Vicci, for an incredible evening. You are a little person with a gigantic talent. May you pack houses everywhere you go. I did an Olympic distance race this weekend in Fairview, Oregon. It was my first triathlon since Ironman Canada in 2010. As I’m training again this summer for Canada in August, I knew I needed to do a couple of smaller races to get ready and remind myself how transitions work. This was my first venture back into the field, and I did really well! I keep a race results spreadsheet for my half-Ironmans and Ironmans, but I haven’t kept one over the years for sprint and Olympic distance races. If I had, I’m pretty sure the results would show that my time this weekend was my fastest ever. 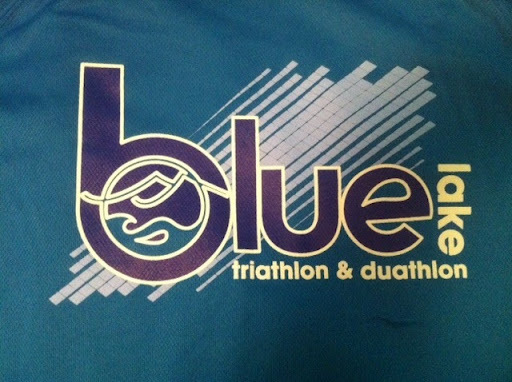 I completed this Olympic distance race (1500 meter swim, 25 mile bike, 6.2 mile run) in 3 hours and 18 minutes. I had two really slow transitions (totaling almost 13 minutes), partly because I had to get out of my wetsuit without the aid of a stripper! But the really big news for me was that I did the bike at an average of 18.2 miles per hour. That wasn’t a typo. 18.2 mph! If you have ever ridden with me, you know that is huge for me! Usually, I don’t break 15 or certainly 16 as an average in a race, and normally, I’m much slower than that. I had been feeling like my biking was improving, but it’s nice to get that confirmation in a race. Plus, I managed to follow that ride up with a respectable run – 68 minutes. I didn’t walk. I wasn’t hurting. It was just a good, solid effort on my part. I’m incredibly pleased. I think the difference for me is that I’ve been biking on the road during the week, in addition to doing a weekend long ride. Normally, I’d spin during the week and hit the road once on the weekend. The extra day a week on the road has made a big difference. Also, I’m being really consistent in my training. I’m finding that I have energy and that my body recovers quickly after hard workouts. Like this weekend, I rode 44 miles on Saturday and then did the race on Sunday. I felt fresh Sunday morning, and today, I’m ready for a recovery swim. My body isn’t beaten. I think I’m well on my way to a solid race in Canada. All I want for Christmas is a solid race in Canada. Santa, are you listening? I spent the weekend in Portland training with a eye on Ironman Canada. On Saturday, I rode 77 miles in just under 5 hours and 30 minutes. For me, that means significant progress on my bike. The course had a mixture of long flats and segments of rolling hills. I tried, whenever possible, to stay in my big chain ring and to push 15 or more miles per hour on the flats. I drank electrolytes and some protein. My goal was to feel strong most of the way, and I did. I felt less strong running for twenty minutes off the bike, but I’m calling the bike a victory – a major one. I think getting out on the road just one more day a week is paying off. On Sunday, I did a 2.4 mile open water swim. It took me right at 90 minutes, which is slow for me. I prefer to see 85 minutes or even 80 minutes. My first lap took 43 minutes, so I must have slowed on the second lap. Either I slowed or I meandered in the water. I think I did a little of both, as I somehow lost my pacer on the second lap and ended up swimming most of it without another person nearby. I’m not the best at sighting, but I tried. I suspect I won’t have that problem in Canada with 3000 people at the start. I should be able to put my head down and just swim with the pack, which should help me be faster. That’s what I’m telling myself anyway. Both workouts did much for my confidence, as did waking up this morning feeling fresh and energized. I like recovering quickly. Today was supposed to be a day of rest or an easy swim, but I was craving something different, so I went to Bikram yoga. It was clear with each stretch that it had been months since I’d been to yoga, but I’m better for having gone. And it felt good to just sweat like mad. Speaking of sweating like mad, I’m heading to Austin this week. The highs there are in the 90s, which is slightly warmer than Portland. By “slightly,” I mean 30 degrees warmer. I hope I haven’t forgotten how to train in the heat. I guess I will find out this week. I don’t mean that I want work. I want some Jobs, as in Steve Jobs. I want his imagination, focus and determination. I just finished reading Walter Isaacson’s biography Steve Jobs. It’s enormous and wonderful. I started it expecting that it would take me a month to work through its 571 pages. I assumed I would have to muddle through some mundane parts or gloss over technical things I wouldn’t understand, but I didn’t. I inhaled every word from the introduction through the acknowledgments. Rarely does a book engage me so fully. I wish I had known Jobs. I wish I could have heard him speak. I wish I had witnessed his intensity firsthand. I never paid attention to the releases of Apple products – or any products really. I wish I had paid attention to the phenomenon known as Apple and the “crazy” driving force behind its ingenuity. This book got me wondering again if you have to be a little “off” to be brilliant. How many truly creative types are there in the world who have been described as normal people? Jobs was not normal. He had eccentric eating habits and a temper. He yelled and cried at work. He created tension and drama in all his spheres of influence. But he loved the intersection of art and science, and he insisted that every Apple product be a combination of the two. He built two empires on that passion. When asked whether Apple should conduct a market study, he refused, taking the position that people couldn’t know what they wanted until Apple showed them. To make a statement like that takes a unique brand of arrogance. And Jobs had that. I want to be one of those crazy people, but I fear I may be too normal to do anything hugely imaginative. Can the kind of lunacy that encourages creativity be developed? Maybe I should eat nothing but carrots for a month and stop wearing shoes and work on my yelling voice. No, I don’t like people who yell, and I like food, and I have no interest in being a barefoot runner. Plus, I think the kind of lunacy I want can’t be contrived. It should be authentic. Do I even have an inner lunatic? Can it be unleashed? I hope so. I was sitting here wondering whether Steve Jobs would agree, but I’m 100% confident that it would never have occurred to him to ask such a question. He would have been far too busy doing things to sit and wonder whether there was something he could or couldn’t do. Maybe the lesson is to be a doer, no matter what. Just be a doer. A doer of what exactly? I don’t know yet. But I’m making it my business to figure that out.